which can be measured during the recruitment phase. recommendations. Leading to a better business. Carers who are technically proficient and proficient at building and maintaining therapeutic relationships are the most valuable asset. Personality variables determine whether someone is likely to be an average aged care worker or an excellent one. Better care is entirely based on the perception of the client/patient. The therapeutic relationship is what dictates whether someone perceives to have been cared for or not. Referrals from current clients or patients are the most influential and most cost-efficient form of marketing. This will dictate the future of your organisation. Science driven, assessment based eRecruitment designed to help you find the best carers. As the aged care industry transforms into a Customer Directed Care (CDC) model of service, aged care providers will need to innovate to stand out. Organisations can't afford to cut level of service, food or facilities to thrive in the new economy. In the new (CDC) model, customers get more choice. The challenging news for aged care providers is they need to change. Organisations need to cut costs and improve efficiency to stay competitive as well as improve their marketing capacity. Identify the best talent to provide the best customer care. Reduce hiring mistakes and turnover through scientific based selection standards. Reduce costs associated with a resume-based selection process. Improve the quality of each hire through better selection data. Generate more referrals by delivering superior customer care. Personality determines whether someone will provide average care or great care. are you measuring the key differentiator in your organisation? Reduce time-to-hire by up to 70% while virtually eliminating the chances of getting a bad hire. Lets you know exactly who's in front of you why they'd be suited to the job or why not. You get a dashboard which displays all of the data that you'll need to make an objective and accurate hiring decisions which give you better staff. Personality assessments are also legally defensible because they rely on scientific measurement, not 'gut feel'. When you have competencies developed, you can measure the specific variables to determine whether someone will be adequate or not. Certain personality attributes will tell you how someone will cope with important factors such as burnout, depersonalisation, and emotional exhaustion which have a large impact on turnover in the aged care and healthcare industries. Features of this eRecruitment system. 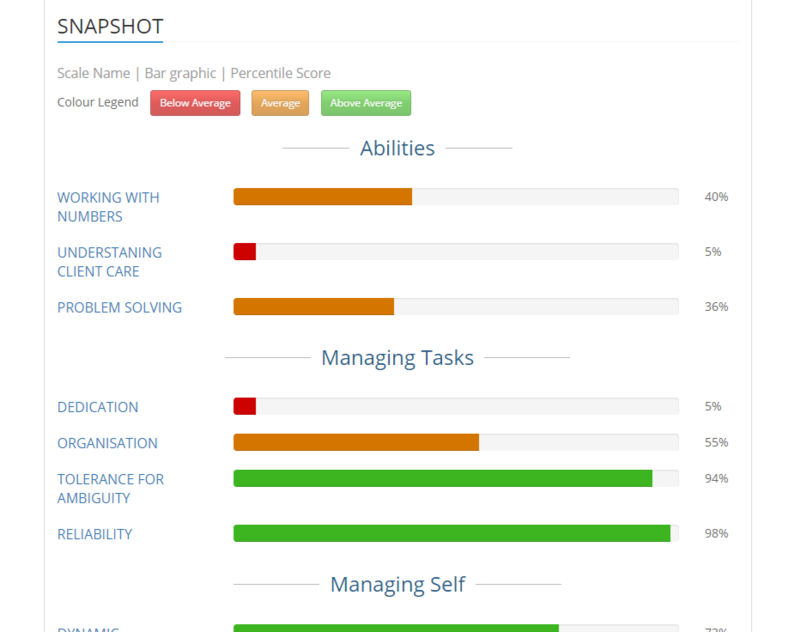 Provide instant views of key staffing metrics through intuitive graphs, tabular data and custom reports. Keep all users focused on their unique responsibilities with role-based access and personalized views of tasks and due dates. For more specific ability or personality based testing, test your screened candidates prior to interview. Screen best fit candidates using customised screening questionnaires which match job needs and specific organisational role and KPI requirements. Safe, secure, and reliable online interviewing for both pre-recorded and live scenarios. Pre-screen applicants, and score and rank candidates based on answers for questions regarding basic requirements to work at the organisation. Save time and money with electronic requisitions and approvals while generating personal emails for better candidate communication. Your eRecruitment platfrom is branded to your organisation's look and feel. This gives candidates a better expereince, making them more likely to tell others to apply. Our assessment-based eRecruitment system generally cuts 70% off your time-to hire metrics as well as being far more accurate than traditional processes at every step. There is no limit on the number of applicants you wish to assess. As well as comprehensive written reports, our experienced psychologists are happy to explain results as well. We give you support for free via phone and email every working day. 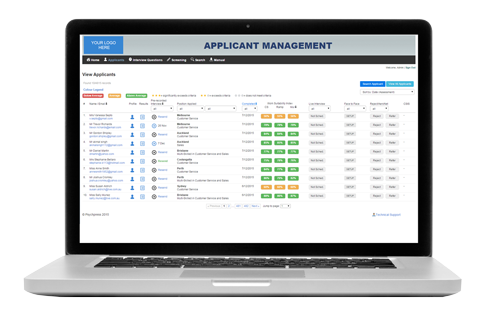 Access your entire recruitment system from your desktop, tablet, or smart-phone. 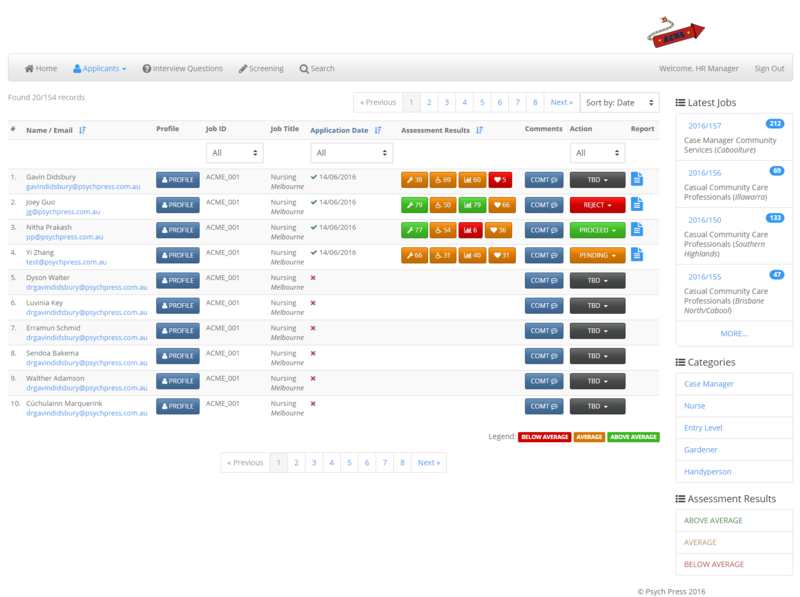 Your whole Recruitment process can be managed from one screen. Accept candidates and schedule them for an interview with the touch of a button. Gain an overview of your recruitment process. Automatically send rejection emails to unsuccessful candidates. View screening data to know which candidates will continue to the next round. Add comments to candidate profiles to stay organised. Once an applicant has completed each assessment, it is added to your dashboard so you can have objective data to support every hiring decision you make, to get the best carers. View applicants' cognitive abilities, personality characteristics which determine whether your applicants will provide a superior level of client care. Online Career Sites Enhances your employment brand by establishing your online career sites and linking to the e-recruitment process. Job Posting Post opportunities to your own career sites, job boards, or have our team prepare job descriptions matching the role and KPI's. Workflow Automation Save time and money with electronic requisitions and approvals while generating personal emails for better candidate communication. Candidate Management Instantly view your entire candidate database, import/export contacts from and to Microsoft Outlook and Excel, and set follow-up reminders. Automated pre-screening and ranking Pre-screen applicants, and score and rank candidates based on answers for questions regarding basic requirements to work at the organisation. Screening system Screen best fit candidates using customised screening questionnaires which match job needs and specific organisational role and KPI requirements. Pre-recorded and real time online interviewing Safe, secure, and reliable online interviewing for both pre-recorded and live scenarios. Reporting and Analysis Provide instant views of key staffing metrics through intuitive graphs, tabular data and custom reports. Self-service Keep all users focused on their unique responsibilities with role-based access and personalized views of tasks and due dates. Psychometric testing For more specific ability or personality based testing, test your screened candidates prior to interview. off your time-to-hire? Get in touch or request your demo today!